We were bound for Bunbury, 50Nm south then further afield to sample the lovely environs of WA’s south west. But we had a couple of false starts. I blame it on the sun, rising too early in the morning and making us look like late starters. It's my excuse anyway. The trick to making a passage somewhere, anywhere, is to wait for favourable winds. Left Mandurah in a steady easterly breeze, which is quite favourable, had Ashiki sluicing along at 5 knots average - what a sail! At the 10Nm mark I had already had a large spell below, horizontal on the couch. This is a favourite position of mine, and is as far as I am concerned the essence of sailing. The sporting yachtsman can have his heroics on deck or “working on the foredeck” as they say. The junk rigged vessel needs none of that nonsense. This boat and its rig were conceived as one that needs minimal input from her crew, sails herself (attainable when the @#%~ windvane works!) and I can while away my sailing hours in comfort, asleep. If work is required, such as a gybe, tack or reef, those tasks can be performed from the sitting comfort of the cockpit. No rushing around on a dangerous slippery deck. Since we did not have the windvane working properly, Susie was doing a fine job as helmsman (something she loves to do). Until I heard the words from above, spoken quite robustly “OH S#@^!” … causing me to jump. “The sheet is broken! !” or words to that effect.. I poked my head out the companionway to enquire what could possibly go wrong, then saw the foresail sheet, it was still attached to its cam cleat, but the double block was in the air and no longer attached to the deck. The shackle holding the block had exploded into a twisted mess. We had sailed a little beyond the Dawesville Cut. So yes, a trip on deck was warranted, so we made this junk rigged schooner heave-to (stopped the boat in the water) for the task. None of the spare shackles I had fit the block, so I improvised using some dyneema line. It worked, but, I really wanted to replace the block, and since chandlery supplies are a known quantity up here, and not down south, we turned back to Mandurah. A slower close reach, but we are in no hurry. 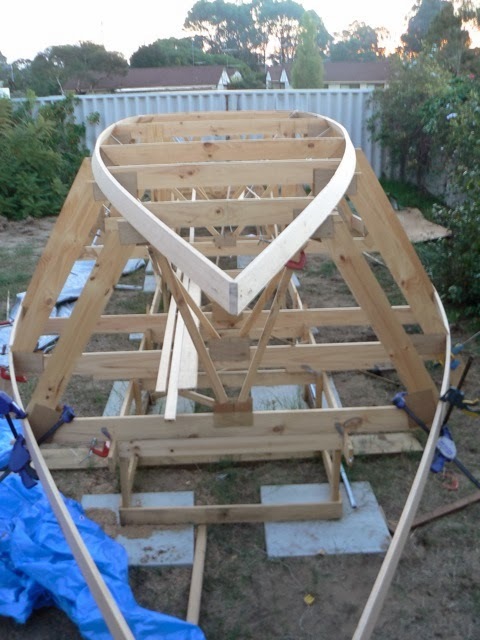 I used the week in Mandurah to work on the trimtab too (enlargening it - I mistakenly made it too small). With new, stronger shackle on sheet block, we set off in another strong easterly. This time we'll sail off anchor correctly and not stuff up. So Ashiki tacked on the wrong side as the anchor broke loose and promptly ran aground. Again. In the same spot. After a couple hours making another solid 5 knots, Susie’s back pain, which was aggravated a couple weeks before in a minor slip in the dinghy, was becoming unbearable. She can be quite stoic, but I knew this wasnt good therefore we decided to turn into Port Bouvard marina, which we had passed 2Nm back. A week’s rest in the comparative calm in a marina would do her back wonders. The sail in was well timed, the wind swung around to help us (which means it was no longer favourable for heading south). By the time Ashiki was through the heads and slanting up the Dawesville cut, she was flying on perfectly flat water and beginning to heel more sharply. It was pretty cool to be racing towards the bridge pylons, heeling at 6 knots and reefing down panels at the same time. Clunk, clunk as each batten drops and Ashiki stands up a little taller each time with no drop in speed. I don’t think the yacht coming the other way could believe what they were seeing. Yep there’s a reason we went junk, its all about reefing. The marina wasn’t that calm either, the only berth available was partially exposed to southerly swells from the Harvey inlet. But Susie still managed to recuperate. We even made a train trip to Perth, saw family, picked up pot holders for our Origo stove top. Can’t cook anything while sailing without pot holders, the pot lands on your face otherwise… Also sourced Susie’s favourite chinese back healing balm. 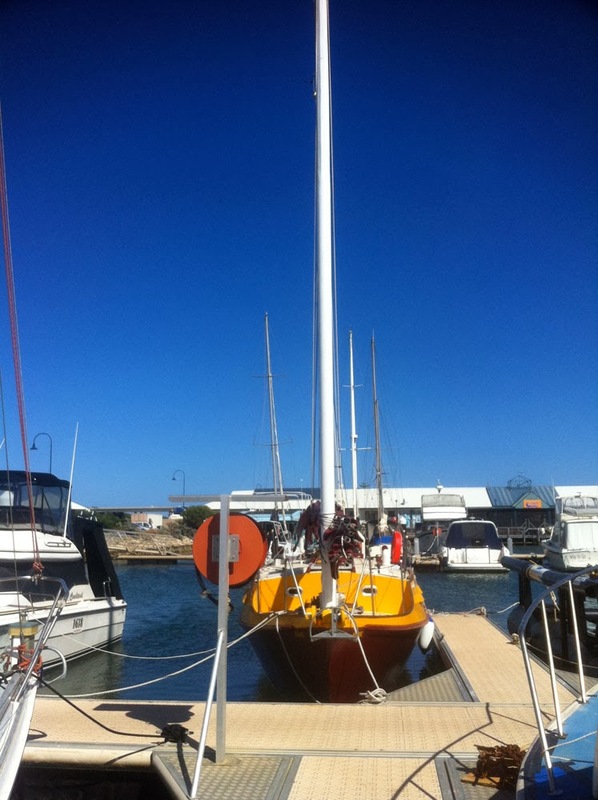 I used the week at Bouvard marina to enlargen the windvane too. 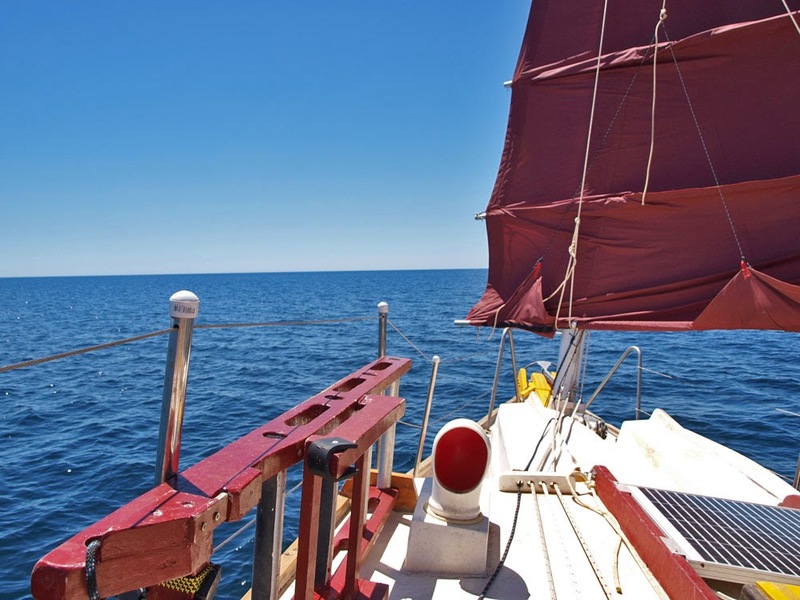 Susie spent the week recuperating by oiling the deck trim and painting said windvane. It was a healthy easterly again, Ashiki blew downwind through the Cut goosewinged (two sails sheeted out opposite sides of the boat), under the big traffic bridge, through the heads and out to the swells of open sea. With the winds gusting 20+ knots we had only half sail up, we gybed the main and pointed our bow SW, so to clear Cape Bouvard before the straight run South. It was going to be our first overnight passage.